At about the same time the transition of book-writing from papyrus rolls to parchment codices took place, new kinds of writing developed. Thus uncial originated as a calligraphic representation of the Roman cursive capital. It survives in over 500 manuscripts from the 4th century on, and lasted as a widespread text hand until the 8th century. Remarkably, the new script seems to have been favoured for christian prose texts, classical literature remaining the play ground for capitalis for a longer period. Uncial is a majuscle or 'capital' script: most of its letters are written between two horizontal lines, like our modern capitals; except for H and L (with upward strokes or ascenders) and F, G and P (with downward strokes or descenders). 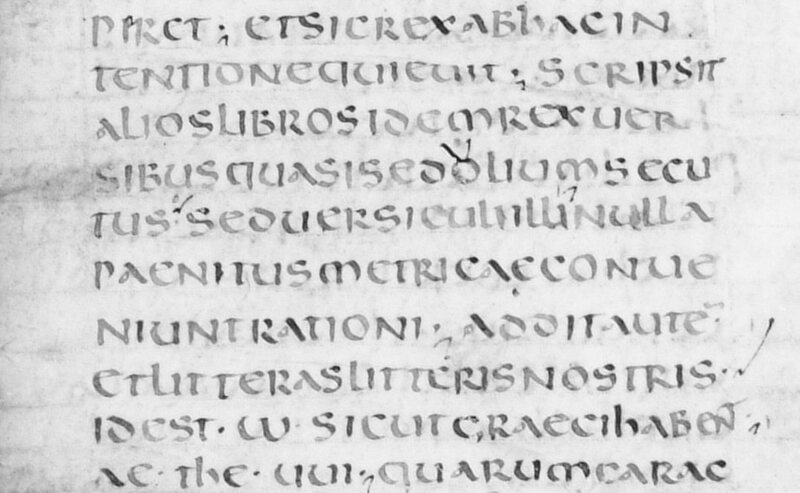 Typical uncial-forms are A, D, E and M.
As with the capitalis quadrata and the capitalis rustica, the use of littera uncialis since the carolingian age again was in most cases restricted to incipits, explicits and rubrics. It is some­times still being used in calligraphy or de luxe prints of religious texts. E.A. Lowe, 'A hand-list of half-uncial manuscripts', in: Miscellanea Francesco Ehrle, vol. 4: Paleografia e diplomatica. Rome 1924, p. 34-62. E.A. Lowe, English uncial. Oxford 1960. Jan-Olof Tjäder, 'Der Ursprung der Unzialschrift', Basler Zeitschrift für Geschichte und Altertumskunde 74 (1974), p. 9-40. Like the uncial derived from the Roman cursive capital, the half-uncial apparently evolved from the Roman cursive minuscle. 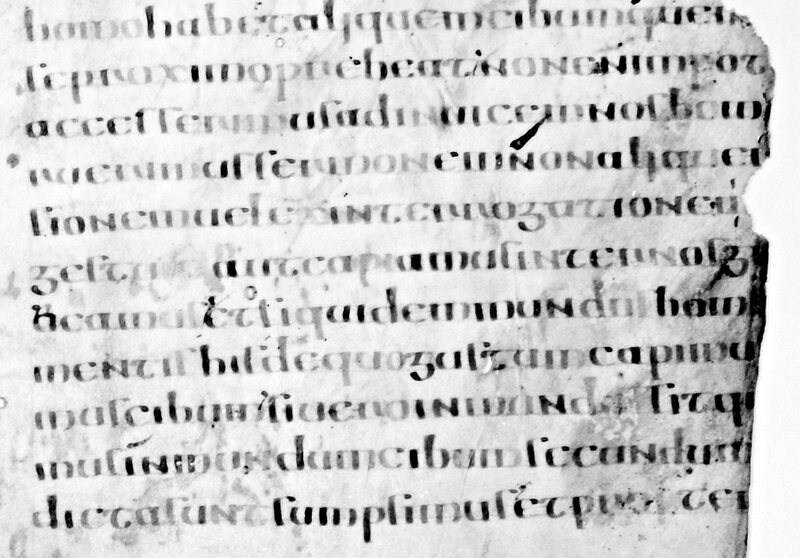 The name half-uncial or 'semionciale' is therefore mis­leading, since it did not develop from uncial, though it shares some of its features. Two kinds of half-uncial minuscule scripts are to be distinguished. The older, eastern type came up in the 3rd century and was used until the 5th century in manuscripts with a North-African or Byzantine provenance. The earliest European manuscripts written in the later half-uncial script are datable around the year 500. In the next centuries this later type was used occasionally in Italy, Spain, merovingian Franceand perhaps also in the south of England. On the whole, half-uncial was much less widely diffused than uncial. It vanished as a book­hand in carolingian times, even though similar writing was adopted for some generations as a display script in Tours (and elsewhere?) from the mid-8th century onwards. Leiden, UB : ms. VLO 88 A f. 2r; Southern (?) Italy, second half 6th century.